What are the 2014 Roth IRA rollover rules? If you're considering a Roth IRA rollover in 2013, you need to know. Because as of January 2010, the rules dramatically changed for Roth IRA conversions. But before addressing the details of those rules, let's review the current Roth IRA rollover rules. It's important to know each of these rules when performing a Roth IRA rollover, but the 2010 rule changes significantly altered this list, particularly the first bullet point - adjustable gross income (AGI) under the IRS limits. So let's focus on that. Under the old rules, if you wanted to roll over funds from your 401k, Traditional IRA, 403b, or another qualified plan to your Roth IRA, you could only do so if your adjustable gross income (AGI) was no more than $100,000. This rule essentially prohibited people with six figure incomes from making Roth IRA conversions. If you once found yourself in this situation, you were out of luck when it came to making a Roth IRA conversion. Because of modifications to the Roth IRA rollover rules in 2010. As January 2, 2010, anyone can make a Roth IRA conversion, regardless of income or tax filing status. The 2014 Roth IRA rollover rules keep in place the elimination of the $100,000 adjustable gross income (AGI) limit on making a Roth IRA conversion. The rules also eliminate the prohibition on conversions for married persons filing separate tax returns. So if you've missed out on the benefits of a Roth IRA in years past because of your income or tax filing status, 2013 offers you a great opportunity. For example, let's say you have a Traditional IRA worth $89,500, and your adjustable gross income (AGI) is $120,000. In 2014, you can perform a Traditional IRA rollover to a Roth IRA even though your AGI exceeds $100,000. Of course, whenever you perform a rollover, the odds are pretty good that you'll owe taxes, and that's an important subject for us to cover. For 2010 Roth IRA rollovers, the IRS provided you with the option to pay 50% of your tax bill in 2013, and 50% in 2014. If you perform a rollover in 2014, the taxes are due in 2014. The same is true for 2015 and beyond. So how are the taxes calculated? 2014 Roth IRA rollover taxes are calculated the same as any other rollover. Your tax bracket (using pre-rollover AGI) determines your tax rate, and that tax rate is applied to all taxable portions of your rollover distribution. For example, let's say you have a SIMPLE IRA worth $80,000, and you want to perform a rollover to a Roth IRA. Your current tax bracket is 30%. You owe $24,000 in taxes as a result of the rollover ($80,000 at 30%). This entire tax bill is due in 2014, so make sure you aren't misled by old rules from 2010 allowing you to pay the tax over a two year period. Even though the $100,000 income limit on making a Roth IRA conversion expired in 2010, that doesn't mean that the income limit for making an annual Roth IRA contribution also expired. If you earn more than the Roth IRA phase out limits, then you can NOT make new contributions to your Roth IRA. So what are the limits? If your modified adjusted gross income (MAGI) exceeds the limit, you can NOT make a direct Roth IRA contribution for the current tax year. So remember, the 2014 Roth IRA rule changes do NOT effect the Roth IRA contribution limits. What they do effect is the $100,000 AGI limit on Roth IRA conversions. And that's where you see a sign of light if your income is too high to make a Roth IRA contribution. Because thanks to the 2014 Roth IRA conversion rules, you can take advantage of a backdoor approach for making Roth IRA contributions. All you have to do is make non-deductible contributions to a Traditional IRA, then immediately convert your Traditional IRA to a Roth IRA. This effectively eliminates the income limit on making a Roth IRA contribution. Let's say you're married, 38 years old, and earn $247,000 per year. For years, you've wanted to open and contribute to a Roth IRA, but you couldn't. Under current and future IRS rules, you're prohibited from making any direct contributions to a Roth IRA. Because your modified adjusted gross income (MAGI) exceeds $191,000. But as long as you make non-deductible (after-tax) contributions, you don't have to worry about income limits restricting your ability to contribute to a Traditional IRA. As a result, you can fully fund your Traditional IRA to the tune of $5,500. Once you've done that, you can convert your Traditional IRA to a Roth IRA. And since you made contributions to your Traditional IRA with after-tax dollars, converting your IRA to a Roth IRA does NOT trigger a taxable event. That means your Traditional IRA funds simply roll over into your Roth IRA tax-free and penalty-free. It means, for all intents and purposes, the income limits on making a Roth IRA contribution no longer exist. So if you're a high income earner, take advantage of the opportunities the 2014 Roth IRA rule changes offer! 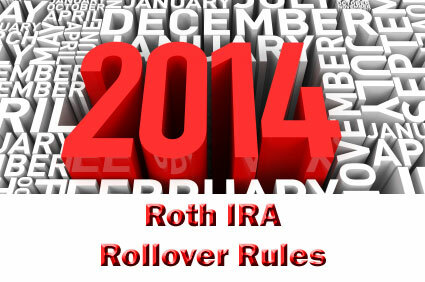 So now that you know the 2014 conversion rules, what are the benefits of a 2014 Roth IRA rollover? The latter point is especially significant. Because unless Congress closes the loophole or reinstitutes the $100,000 income limit on Roth IRA conversions, it essentially eliminates the Roth IRA income limits. And unlike the 2010 tax deferral provision, this is something you can take advantage of year after year after year. So as of January 2010, anyone can open and fund a Roth IRA, regardless of income. The changeover to the 2014 Roth IRA rollover rules continues a significant change in the world of retirement planning that began in January 2010. If you've previously earned too much to meet the Roth IRA eligibility requirements, 2013 offers you the opportunity to establish, and continue contributing to, your own Roth IRA. While the Roth IRA income limits remain intact, the $100,000 limit on Roth IRA conversions is long gone, effectively eliminating any income caps on making a contribution.